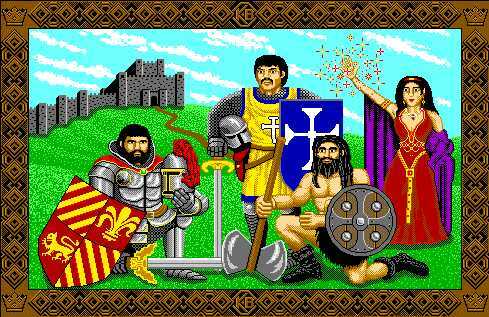 After finishing my Phantasy Star and Phantasy Star 2 threads, I'm in the mood for something a little different: a turn-based strategy game. 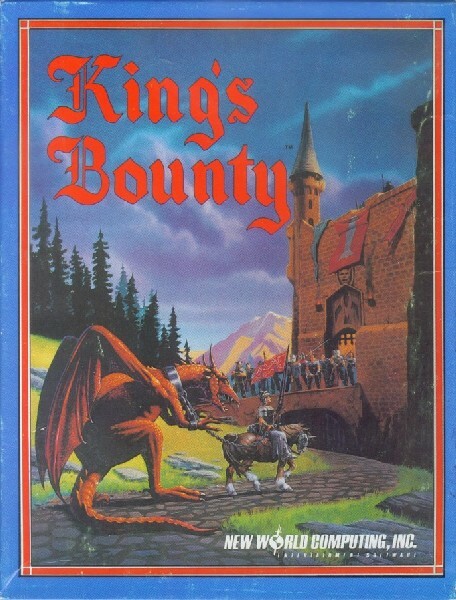 If you've played Heroes of Might and Magic, this game is going to seem familiar to you: King's Bounty pioneered the game engine that later became HoMM. 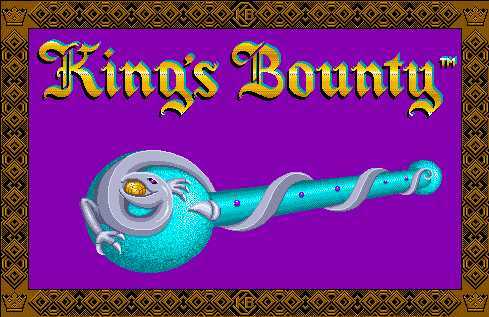 It was released for a number of platforms, including DOS, Amiga, Macintosh, and Sega Genesis; I'll be LPing the Mac version, because it has the best graphics and includes mouse support. 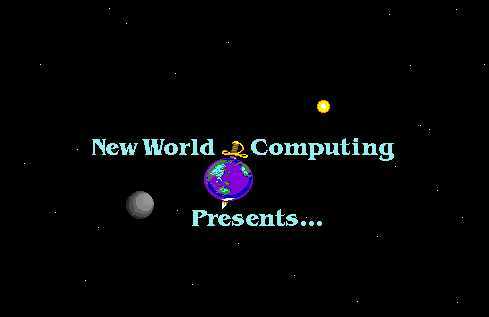 Remember New World Computing? They were bought out by 3DO, and then 3DO went bankrupt. Months had passed since the theft of the Sceptre. The Four Continents were falling into ruin. All the many castles which crossed the land were inhabited by one of Arech's henchmen or a horde of monsters. The last remaining outpost of Order was the King's Castle, where some trace of the Sceptre's location was eagerly being sought after. Maximus was dying. All Arech wanted now was his death and it seemed as if Maximus was going to give him that too. Arech was patiently waiting for the day Urthrax Killspite would sit upon the throne and Chaos would rule supreme. Maximus smiled, a last glimmer of hope. He had a suprise for Arech and Urthrax. A hero was on his side. Recently returned from a conquest of a ferocious, evil dungeon, the hero agreed to raise armies and recover the Sceptre from Arech. Maximus would cling as long as he could to life. The hero was the only chance for his people and his land to remain pure, and the hero only had until the time Maximus died to recover the Sceptre. A seed of worry bloomed in Arech's mind. Resting comfortably within his newly acquired castle, Arech listened to Magus' report with distress. They were sending a mighty hero after him to recover the Sceptre. Damn heroes anyway, they always seemed able to do the impossible. But not this time, thought Arech, not with me. I will make it truly impossible. Arech put his plan into action. He buried the Sceptre in a secret location and then fragmented the map into 25 pieces. He and his followers each kept a piece of the map and he placed the remaining 8 with artifacts of power which he could not use. Let them find the Sceptre now. tl,dr version: The Sceptre of Order, symbol of King Maximus' righteous rule over the Land of the Four Continents, has been stolen by a dragon who wants to kill off Maximus and replace him with a demon king. Due to the loss of the Sceptre, Maximus has fallen ill and the lands are overrun with monsters. Our goal is to find and retrieve the Sceptre before old Max dies. Knight: The classic choice: an armoured hero gallivanting about on horseback, slaying dragons, rescuing princesses and so forth. The manual recommends this class for beginners, but if I were a beginner I wouldn't be doing this LP. Pros: High leadership, which means he can recruit a large army. Good starting gold. Shiny armour. Cons: Slowest level advancement: to gain promotions (giving access to a higher weekly income and better troops), he has to capture more villains than any other character. Starts out not knowing magic: has to pay 5000 gold to learn it, and even then his spells are weak. Starts with a low weekly income, and doesn't catch up with other characters until his final promotion. Appears to be a dwarf or something. Paladin: A holy warrior who wields divine power to defend the forces of law and good. Questing for sacred artifacts of order is right up his alley. Pros: Slightly better magic and faster level advancement than the Knight. Cons: So-so leadership. Still needs to pay 5000 gold to learn how to use magic. 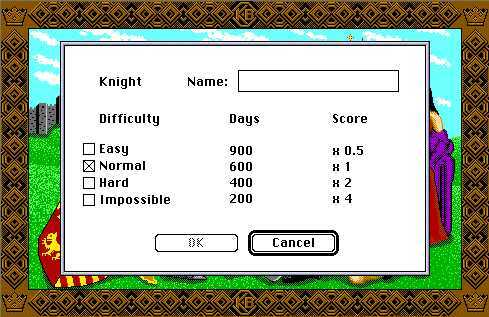 Same slow income progression as the Knight. Goofy moustache. Barbarian: He thinks that carrying a huge axe around is an acceptable substitute for everyday social skills, like knowing to wear a shirt when you meet with a king. He's right. Pros: Leadership equal to the Knight. Fastest level advancement. Probably the best overall income progression of any character. Awesome facial hair. Cons: Even less magical ability than the Knight. The Barbarian can still gain a lot of benefit from magic, but he won't be able to memorise as many spells as the other heroes, and any spell with an effect that depends on spell power will be pretty useless to him. Sorceress: She's a chick with balls. Fireballs, that is. Pros: Best starting income, best magic by far. Will eventually be able to break the game in ludicrous ways. Cons: Funky level advancement curve: her first promotion takes the longest of any character, although her next two are faster than the Paladin. Lowest leadership -- can only control about half as many troops as a Knight or Barbarian. Gains less income with each promotion than the other heroes, and ends up earning less than anyone else. Has trouble beating the game on higher difficulties except by breaking it in ludicrous ways. Finally, I'll need you to select a name for the hero (or heroine), and a difficulty setting. Apart from affecting the number of days you have to find the Sceptre before Maxy-boy dies and you lose, higher difficulties mean that stronger monsters are more likely to spawn early in the game. (Running into dragons on the first continent is always a fun experience.) Each difficulty also applies a multiplier to your score, which is purely for bragging rights. I can beat the game on Impossible as the Sorceress, but I'm not as confident in my ability to do so with the other heroes.